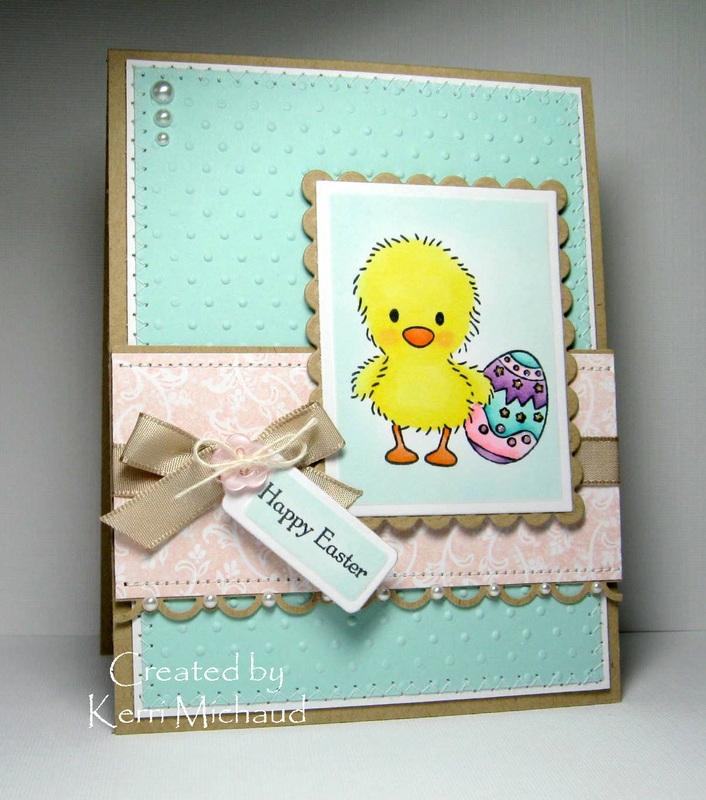 I used this super adorable image from the set Fhiona's Little Easter Buddy. I stamped the chick, then masked him so I could stamp the egg. I think it turned out really cute : ) The sketch is The Sweet Stop Sketch #48. We were to use something fuzzy, and I think this fuzzy little chick works perfectly! I'm also entering this into the Simon Says Stamp Challenge~Easter or Spring and some Glimmer! I've added Stardust Stickles to the egg : ) I will leave the complete recipe below. Happy stamping! I love this Kerri! What a great idea to mask the chick and then stamp the egg!!! It really is cute!!! What an adorable and darling little chickie!! I love the pretty coloring and layout you used for this card!! This is just adorable! So glad you could join us in the Embellish challenge! Another cute little ribbon/taggie treatment....and that bright lil' chickie is adorable! This is too cute! Love the soft colors, and how you masked the images. This turned out very nice. I like the embossed turquoise. Well, I like the whole card! This is freakin' darling! Love it! What a cute card, and that chick is the sweetest. Hee hee This chick is too darn cute! That chick is awesome! And I love the pearls on the edges of the punch. What a great touch that is! OMGosh I love that little chickie. Great card! Oh, what a cute little baby chicken! Oh, I'm going to have to case this card! It is too cute!!! Love the little details like the pearls on the border and the stitching!! This is so pretty! Love that little chickie! Thanks for joining us for the fun! This is such a cute card! gorgeous! This card is so cute! Thanks for playing along with us!